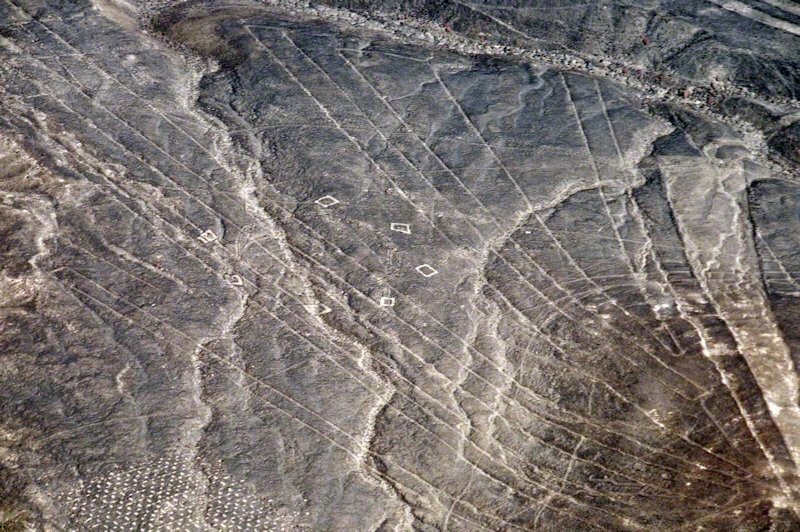 One thing for starters for the people that don't read my texts: No, I'm not saying that the Nazca lines have been built by aliens. 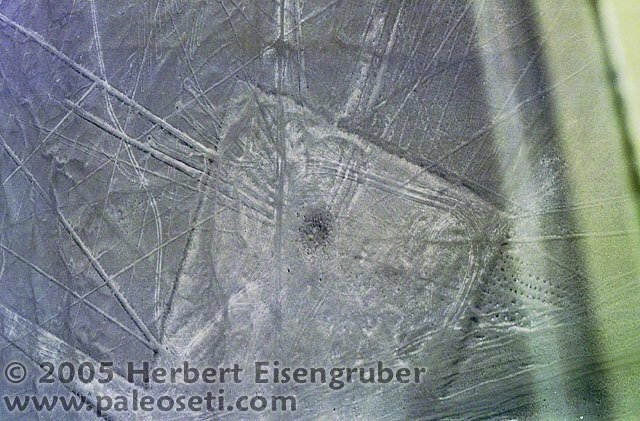 But without those ancient Aliens you will have a hard time to explain them... With this out of the way, please read on and check out what I have to say about them. Close to the tiny town of Nazca in Peru lies on of the most mysterious and unexplained places on our planet. 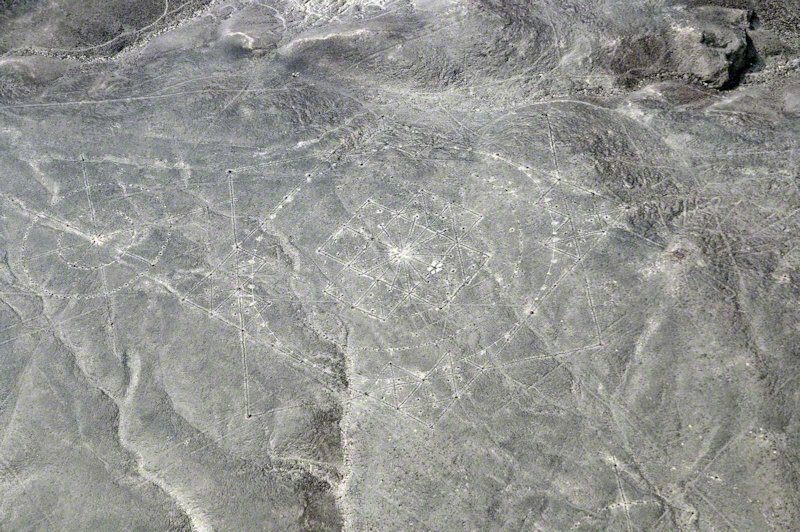 Within a 50km radius one can find hundreds of lines, figures and drawings in the sand. 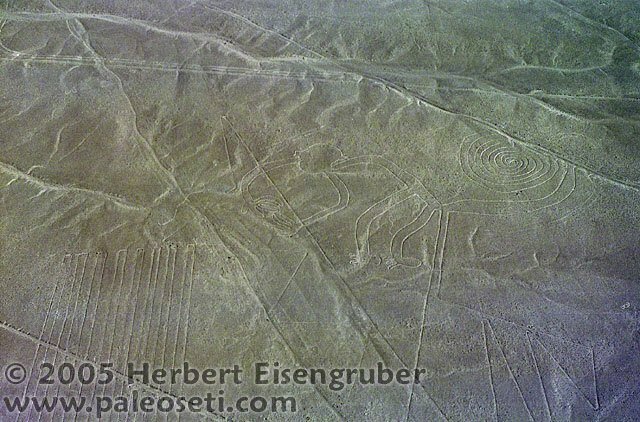 Those drawing are called geoglyphs. What's so special about that? You can only see them from an airplane! The geoglyphs and lines are designed for the flying "gods" in the sky. 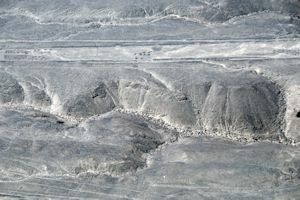 Some of the lines are thousands of years old and run for 20 or more kilometers across this ancient landscape. 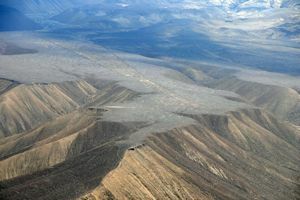 Some of the line run over valleys and mountains. Some mountaintops are artificially flatened. 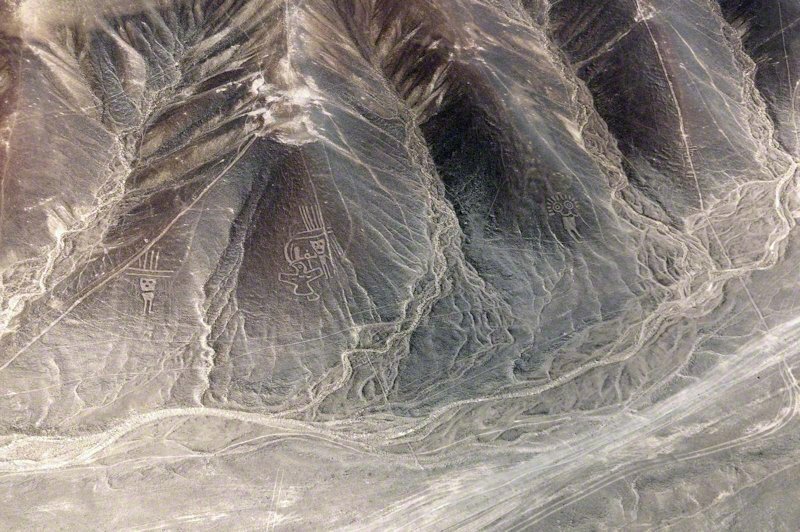 Some figurines drawn on hill slopes have strange antennae, helmets and boots. What did the ancient people of Nazca depict? Who did they want to attract? 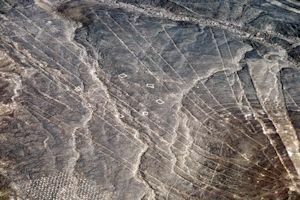 Please scroll down and explore many photos of the Nazca lines. 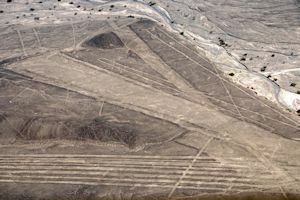 On our last trip to Nazca in 2009 my wife and I also had the opportunity to get extensive photographic material of the Palpa Lines. You will not find many sites on the internet that show you such detailled shots of those lesser known lines and figurines. 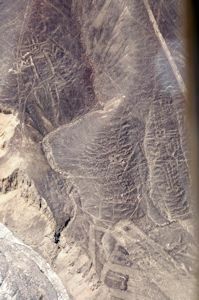 After my visit to Nazca I'm convinced that the lines were built for the astronaut "gods". It is the only plausable explanation. 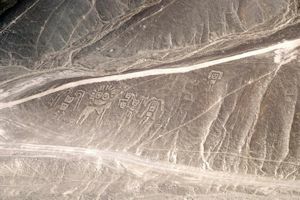 From all the theories about Nazca it is the only one that makes sense. 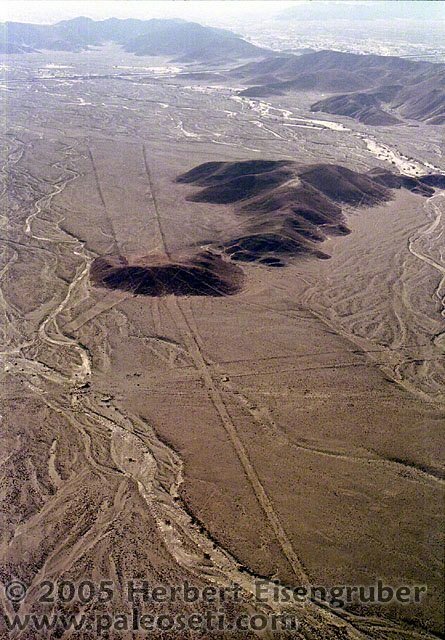 Why would ancient people build - in smeltering heat - gigantic lines and figurines that can only be seen from the sky? 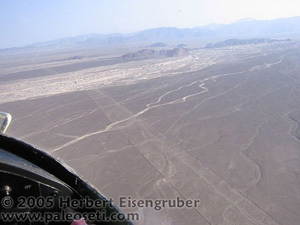 Click here to see a small video of a flight over the Nazca lines. If you have a list of things to do in your lifetime, this should be on it! 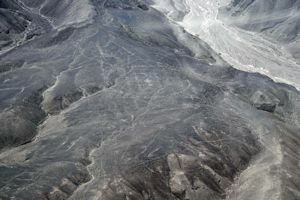 A flight over the Nazca lines is nothing for people that get easily motionsick. 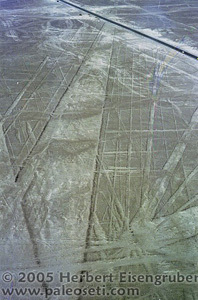 The plane banks VERY hard so that passengers can see the lines. 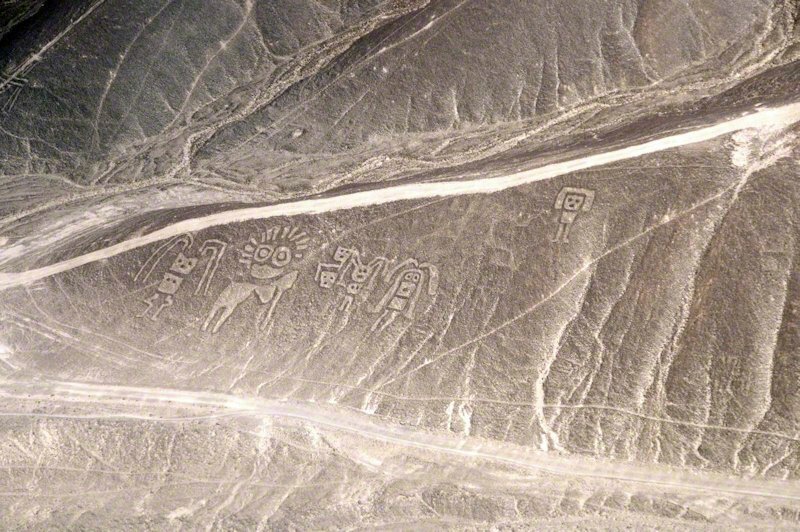 Update: Once you have been to Nazca, it catches your imagination and doesn't let go. 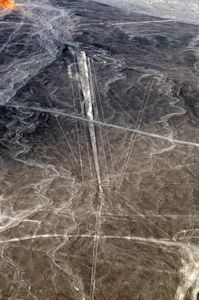 I knew there were a lot more lines out there that I didn't see in my 2005 visit. That's why my wife and I returned in 2009 for an extended visit. We chartered an airplane for a couple of hours and told the pilot to show us the lines that are not usually on the "tourist route". 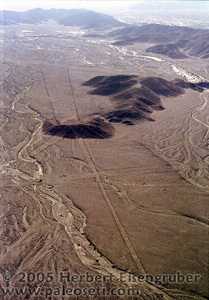 The lines I'm talking about are called the Palpa lines and are about 15 minute flight time away from the Nazca lines. 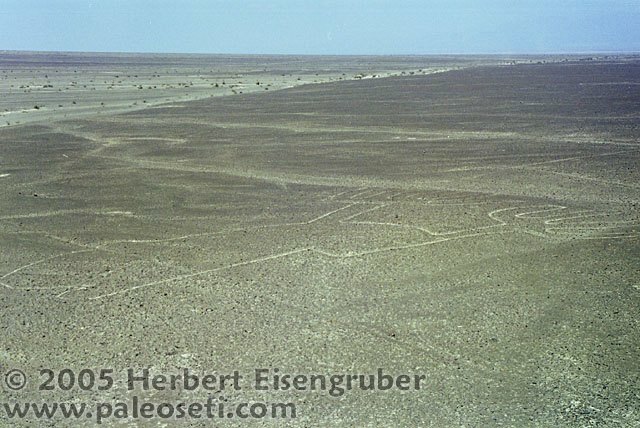 I hope you will enjoy the photos as some of the geoglyphs below I have never seen published anywhere else. From the ground the lines and "landing strips" are very hard to spot. 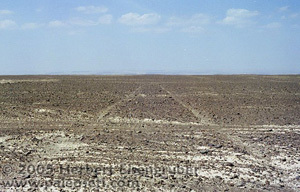 If you drive through the area, only signs give away that you are in a UNESCO world heritage site. 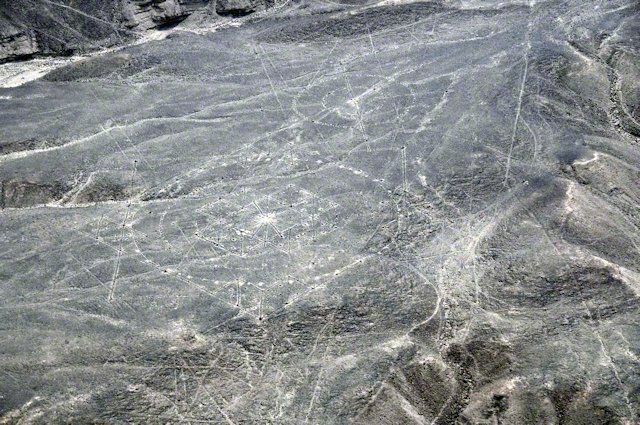 It is strictly forbidden to venture out into to plain of Nazca to protect the fragile lines and shapes. 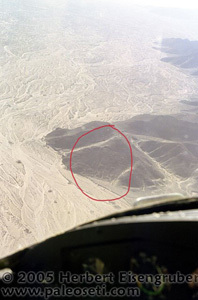 The red circle in the photo illustrate how the lines show up from the ground. Here a closer look. You can stop on the side of the road to get a glimpse of the lines. 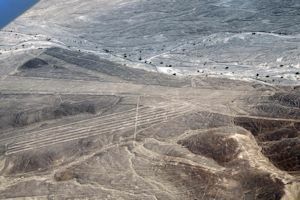 You have to hire a taxi in the nearby town of Nazca to get to the lines. 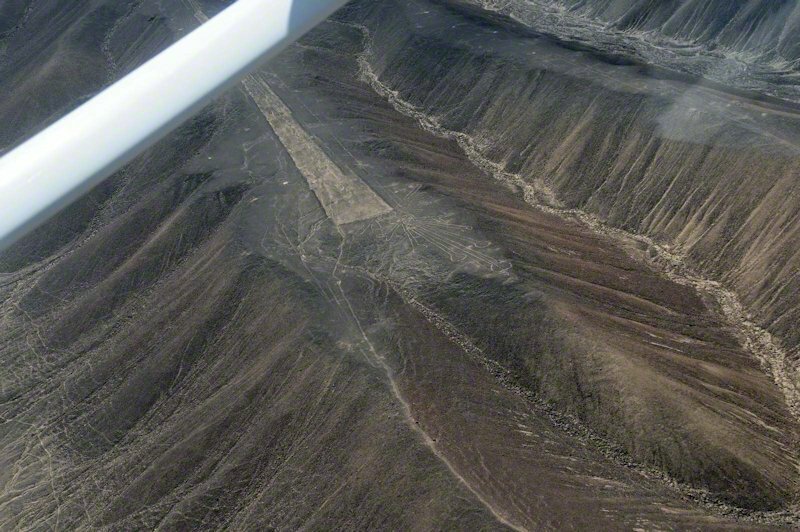 Nazca has a small airport where you can charter little Chessna airplaines for a flight over the lines. This is the only way to see the figurines and the lines in it's full glory. If you suffer from motion sickness, you should take some medication before you go. The planes bank pretty steep in order get a good look. In the photo you can see some lines or "pistas" as the locals call them. After a few minutes of flight you will see the first figurine. It's called "El astronauta" - the astronaut. Need I say more? As you can see "the astronaut" also wears boots. The figurine is carved into the slope of a hilltop. About 10 minutes into the flight you will see an enourmous amount of lines, figures and "landing strips". 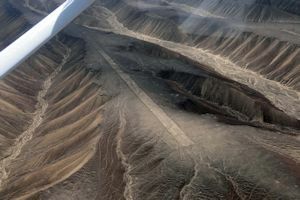 The locals call them that way because the look like landing strips of an airport. 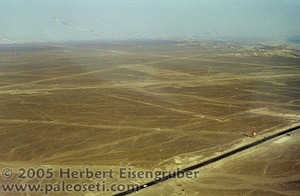 The dark line on top of the photo is the Panamericana highway. 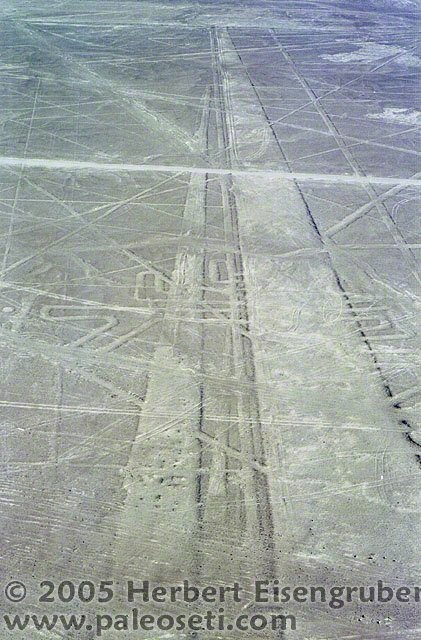 It gives you a good indication of the scale of the lines. They are hard to describe, you have to see them in person to REALLY appreciate them. 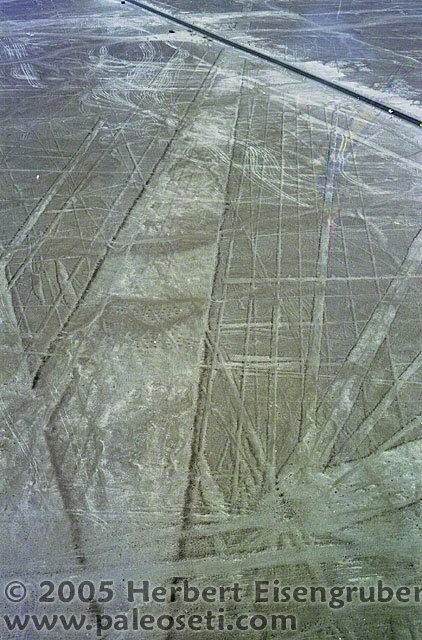 This photo shows nicely how precise the lines are. The big line is about 3km long! Some of the lines meet in one specific point. Nobody really knows why. Sometimes there is a small hill on the meeting point of the lines. The highway you see on this photo is again the Panamericana going towards Palpa. 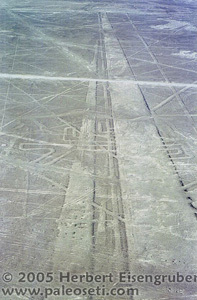 At the end of the bigger strip you see a carved spiral. It's at least 150m in diameter. 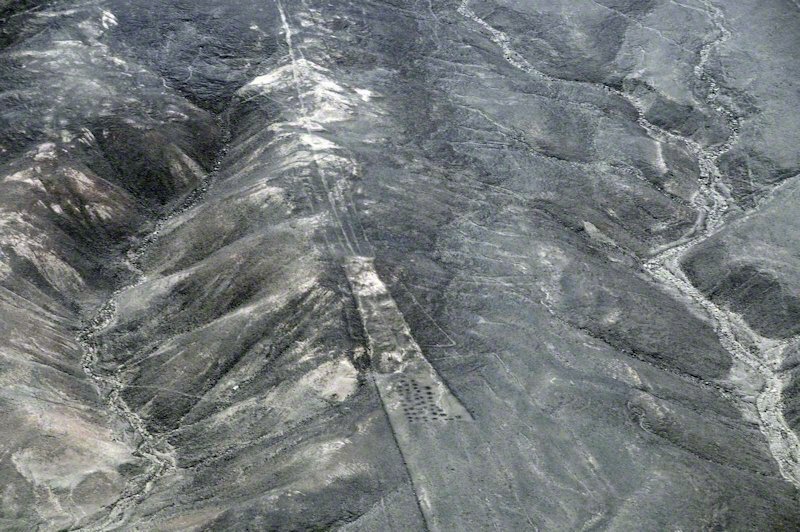 This spiral is very similar to rock carvings and drawings in the southwestern USA. Was there a link of those two people or were both people inspried by the same source? 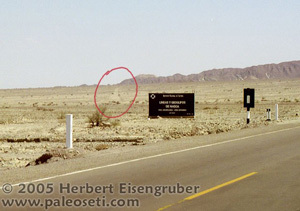 On this photo on the right lower half you see the watchtower built by German araeologist Maria Reiche during the 1970s. From this tower one can see two figurines: The "tree"and the"hands". 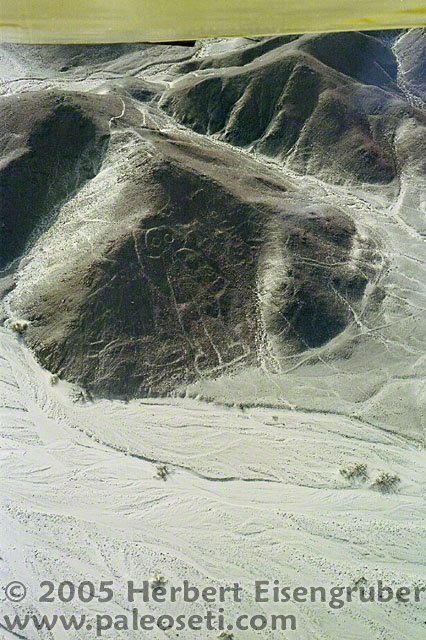 Here you see the "Monkey" - one of the many "geoglyphs" in the plain of Nazca. It's about a 15 minute flight from the Nazca airport to reach the Palpa lines. In fact there are smaller lines on the way as well. The whole are around Nazca in a 30km radius is filled with geoglyphs, lines, holes in the ground, flattened mountain tops and other strange anomalies on the ground. If you enlarge the photo you will see little black dots in the middle of the "pista" as the locals call those "landing strip" like structures. Other black dots are on either end. 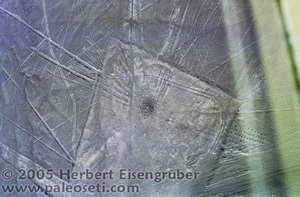 Those dots are very interesting and I will talk more about them further down on the page. 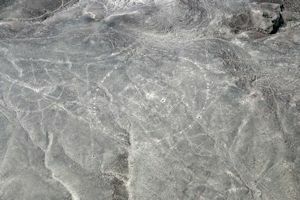 These faint lines are easy to miss, but very intruiging! Take a closer look. The lines radiate out from the circular structure on the hilltop. They are running straight down the very steep mountain slopes, over all kinds of different terrain. After about half an hour we reached this maginificent structure. You really have to look closer to understand what you are looking at. 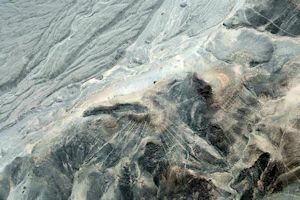 It is of stunning geometrical precision and the closest thing I can compare it to is a Mandala from ancient Buddist or Hindu traditions. If you look closely on the photo on the left you see on the right side of the photograph, (approximately 2'oclock position) a fainter more ancient part of the geoglyph. 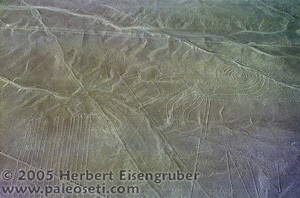 The next two photographs are of different angles of this stunning geoglyph. 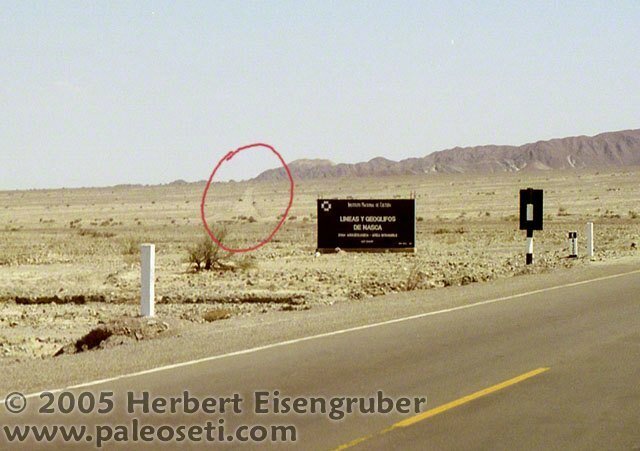 In this shot you will see again those curious black dots that I mentioned earlier. 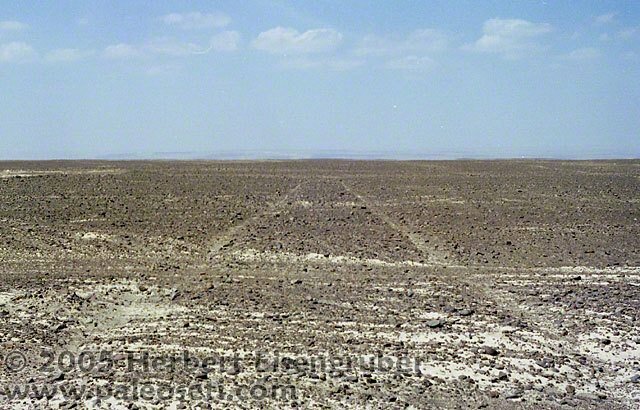 You will also see that one half of the "landing strip" continues while the other half disappeares (bottom of the photo) The "landing strip" also runs over uneven terrain. 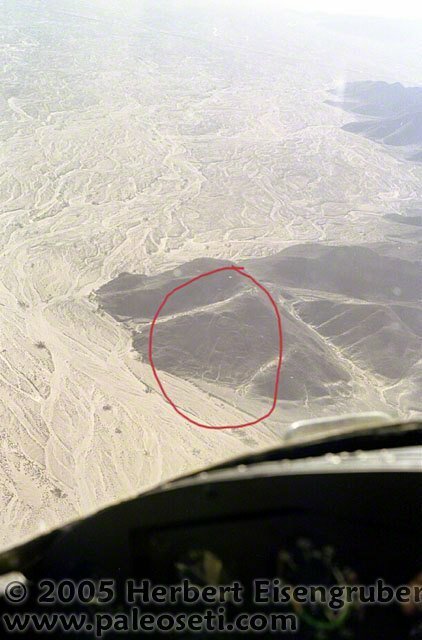 So I believe the "Naza was an alien spaceport" Theory can be discarded. (I know this is shocking coming from an PaleoSeti Theorist. But hold on, I will come to my theory at the end of this article. 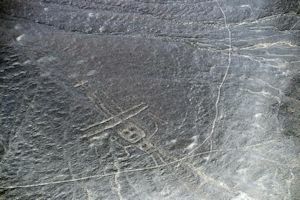 The whole landscape is filled with lines, figurines and other geoglyphs. 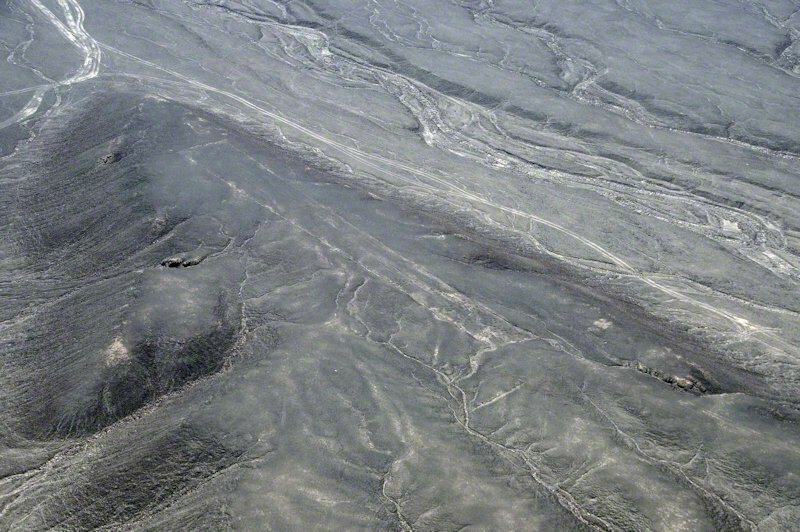 Over 40 square kilometers! 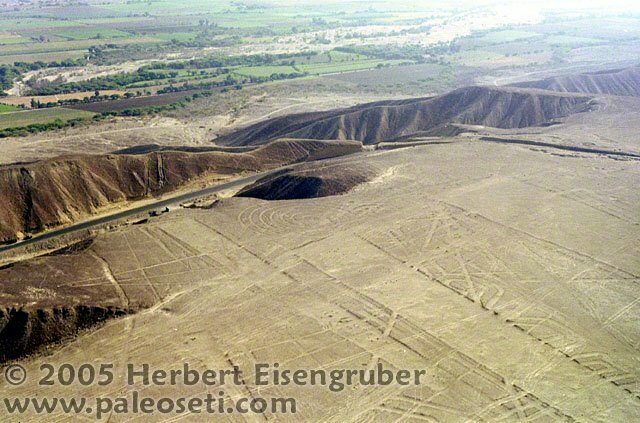 This was more then just some run-of-the-mill cult as archaeologsts say. 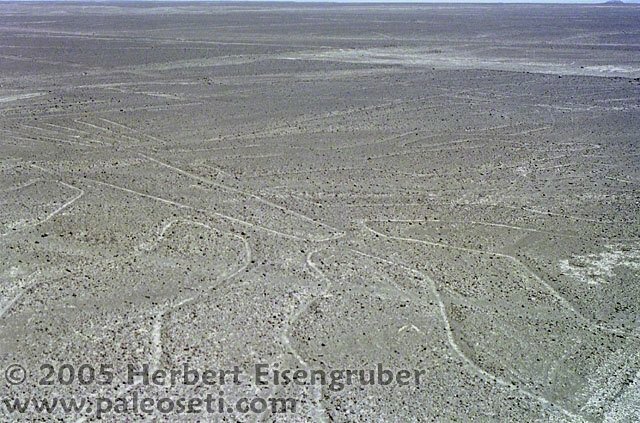 Some of the lines and geoglyphs are very faint and seem completely unvisited for a long time. 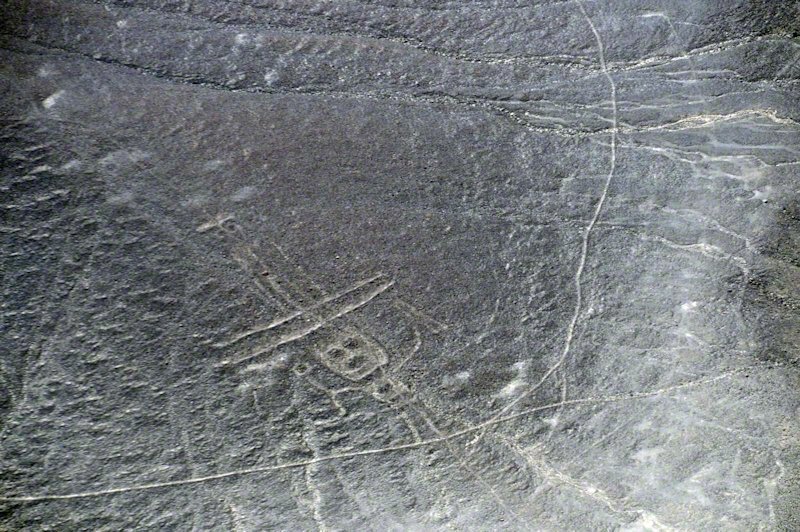 Here as well as in the Nazca plain one can find giant drawings of human like figures with strange hats, antennae and helmets as you will see on the left and the three following photos.